This event was originally scheduled for March 10th but cancelled due to heavy rains. This tour is back on schedule for May 5th. 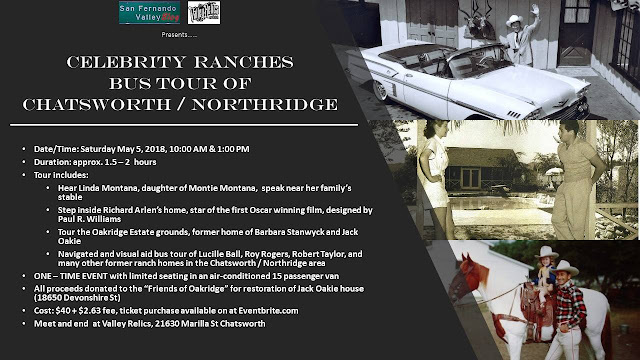 Take a journey on a bus tour of the Old Hollywood Celebrity Ranches of Chatsworth / Northridge on March 10 at 10 AM (SOLD OUT) or 1 PM to benefit the "Friends of Oakridge" restoration of the Jack Oakie House in Northridge. No Comment to " Celebrity Ranch Bus Tour Rescheduled for Saturday May 5th at 1 PM "